I have been fortunate to play a variety of roles on stage over the years. I have seen many faces emerge under the lights of the dressing room mirror – the ingénue, the daughter, the mother, the wife, the lover. My theatre life is all about transformation. It never occurred to me that in all the faces in the mirror, that one day I would come face to face with The Old Lady in My Bones. She arrived with the onset of RA, a spectre I imagined living in my joints, prowling beneath the organic make-up of my skin. She materialized in mornings and on bad flare days, kerbing my fluid movement with inflammation and stiffness. On those weary days of pain and swelling I thought I saw the soft silhouette of her behind my eyes – and then I met her by chance beneath the theatre lights of my latest show. I had never really expected to see her. I knew she was there, in the portals of my imagination, a living embodiment of RA. She looked like how I sometimes felt. Through the magic of theatre I watched her morphing beneath the translucence of my skin and rise to the surface. The dressing room lights emphasised each line, twisting the natural contours of my face into a grotesque and distorted caricature of what I imagined living in my body. 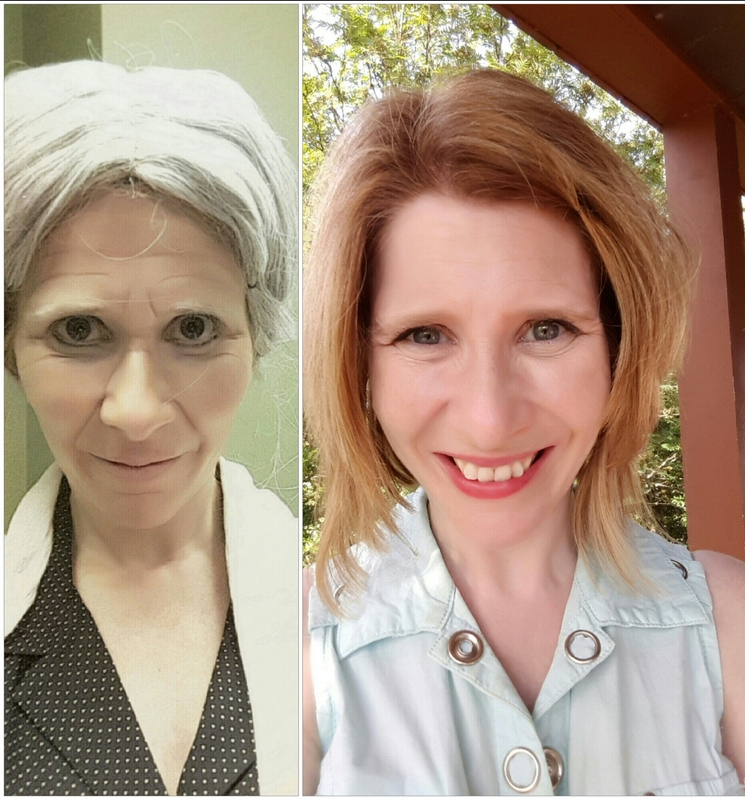 The wrinkles drawn into my face with brown and white eyeliner, the silver threads of an old lady wig covering my pastel ginger locks, gave me an uneasy glimpse into my future. The Old Lady in My Bones was always a presence I had never seen. At first glance she appeared stern and startling – but when I looked closer I saw a youthful spark pulsing in her blue eyes, a strength, a certain wisdom. She wasn’t the ogre I envisioned living in my body. She was as human as they came – she could be manipulated and transformed. Beneath the make-up, my younger self was still thriving. Most people don’t see the old lady in my bones. Most days I don’t see her. She was one of my many faces of RA. She was the face of a woman who endured a demanding eight-day journey in a foreign country, who climbed the Great Wall and hiked through the tombs of the emperors; the face of a woman who fought to return to the stage, leaving RA in the wings, a woman who appreciated and celebrated each small accomplishment; a woman who fought to live the life she wanted in spite of the chronic disease that tried to bring her down. I discovered The Old Lady in my Bones did indeed have a face – and that face was mine. She was not someone to fear – she was someone who lived in spite of RA. She was someone who figured out how to make RA work with her instead of against her. And so would I. Hey, the old man in my bones thinks,, well ok, I won’t say it but it is complimentary (in a manner of speaking). I love the post. As an old man (59, I feel 70 some days) I approve. I know how you feel. I often wake up feeling 80 but usually get back to my usual self as the day goes on. Just so you know, I don’t see that “old man” in you. Stay well.